Replacing the wheels on your rolling garbage can. I’ll make sure these Deathstar plans are delivered to the Rebels! 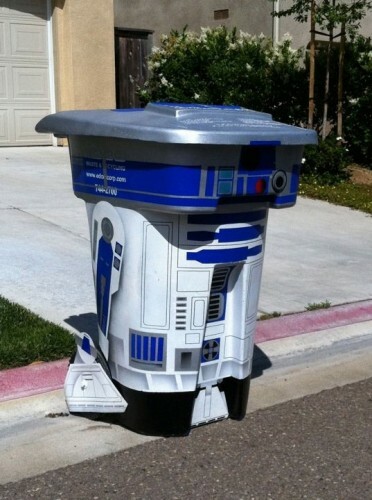 If your trash needs to be hauled to-and-fro, R2D2 will do the job with panache… assuming his cheap, plastic wheels don’t give up the ghost as soon as they encounter a rogue chunk of meteorite on the planet’s surface. For heavier jobs than moving your old feather pillows to the curb, you may need some more reliable replacement wheels. The problem is, most rolling garbage cans come equipped with plastic wheels that are often simply not up to the task at hand. They are breakable, they don’t roll well on softer terrain like grass or gravel, and they can be obnoxiously loud. But we have a solution for you! If you’re looking for replacement wheels, or simply an upgrade in both quality and style, consider these 8-inch yard and garden wheels with metal hubs, or one of our other similar products. They’re tough, reliable, and I’ll be darned if they aren’t good-looking, too. As a bonus, instructables.com has a quick and handy guide for replacing the wheels on your can. Happen to have an old chest lying around? Perhaps an antique from the grandparents gathering dust in a basement or attic? Is it doing you much good? Probably not. Fortunately for you, instructables.com has a solution which will turn your old, not-doing-much-good chest into an old, actually-doing-some-good chest. Here we have a refurbished old chest-turned-fancy-coffee-table. It will be the talk of the town (or at least of your family, who had been wondering what the heck you were doing). This transformed piece will make a beautiful addition to most living rooms, bedrooms, craft rooms, or even bathrooms. But why limit yourself to just one room? Instead of putting feet on the bottom of this chest/table, why not a set of quality wheels like these classic steel ones from wheelandcaster.com? Now you have a mobile example of your artistic classiness to showcase in any room you choose! Party in the living room? Fancy mobile chest. Need somewhere to store those posh flannel pjs in your bedroom? Fancy mobile chest. The applications are limitless. What’s that you say? Those steel wheels will scratch your new hardwood floors made from endangered trees and the tears of bark beetles? Fear not, friend. The boys in the lab have once again attempted science, and created a fantastic product! These rubber-lined chrome ball casters will solve any floor scratching problems you may have, and they can be easily spray painted to the color of your choice. It’s a rare day that the boys in our lab are outdone by a rival outfit, but when it happens I say give credit where credit is due. The folks over at Instructables.com have done it again with this nifty idea – a flowerbed on wheels! Great for a patio, deck, or any area where you don’t have the space to commit a chunk of space to soil. This way you could move your flowers (or herbs, or whatever you agriculture types get up to) to clean under or around, or to take to market or a garden show. This particular set of instructions is for a 3’x3′ bed, but a little customization could adjust that to another size. Here’s a nifty project the boys came up with (with the assistance of the fine folks over at Instructables.com): A living room quality coffee table built from an old pallet and some casters. It’s a detailed step by step with lots of pictures – if you’ve got a wood shop you should be set. Pallets aren’t hard to come by if you live anywhere near a business that receives shipping by truck – industrial places often have piles of them lying around. Find one in decent shape and you can buff out the rough edges. They use rubber casters similar to these industrial balloon cushion plate casters, two with brakes and two without. Personally, I prefer the look of steel wheels for something like this – like these 8-inch semi-steel casters. If you have wood floors, however, the semi-steel might not be great. In that case, the balloon cushion might work better, or you could look at some non-marking poly casters. If you whip this bad boy together (or any other neat DIY project), let us know in the comments! Which Wheels Work Well in Winter? First rule of blog post titles: Always Avoid Alliteration. But back to the question! Winter is upon us, and depending on where you’re located, at some point that could mean snow. The people want to know – does winter weather affect the wheels and casters you depend on to get the job done? Well, the cold alone shouldn’t affect things too much, unless we’re talking extreme temperatures. But anything you’re likely to survive working in, your wheels and casters should hold up as well. Snow and ice can be tricky beasts, however. Since most carts and hand trucks are manually powered, traction usually isn’t too much of an issue, unless you’re moving across some lateral inclines. If sliding is a problem, consider chains or cables similar to those used on vehicle tires. If you’re trying to move things over snow, however, narrow tires can get bogged down. If your hand truck or cart will allow it, consider swapping over to wider wheels with tread. Pneumatics are a solid option. Finally, if the cold just gets to be too much, pull up this picture on your smart phone and let the warmth seep through to your cold, cold heart. Science has long struggled to find a way to accurately measure the weight of objects. If it doesn’t say on the box, then really there’s just no way to know. Guesswork and gut feelings. But, let’s say you somehow are able to determine just how much a thing weighs. And then let’s say that you have a crazed need to make that thing roll around. It can be done – but just how heavy duty do the casters need to be? Too much is overkill and a fine way to drain your wallet; too little is asking for a visit from either paramedics or OSHA, and no one likes them.